Bar Dogwood; photo from Facebook. 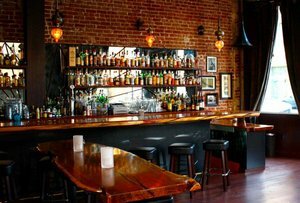 Some bartender updates: Alcademics reports Joel Baker (Bourbon & Branch, nopa, and Burritt Room) is now the bar manager at ~TRES~ in SoMa. More details: “Baker told me he’d look into expanding the tequila program into other agave spirits including adding more mezcal and sotol. They’ll begin serving tequila shots with a choice of sangrita chasers in red or green as well.” Look for some new cocktails on the menu as well. Meanwhile, over in the East Bay, the talented Aurora Siegel (Rose Pistola) is now working at ~BAR DOGWOOD~ in Oakland. She just started last night. And on the wine side, ~CAVALLO POINT LODGE~ has hired Gillian Ballance as wine director. She was most recently a wine consultant for the Pacific-Union Club in San Francisco and Bottega Restaurant in Napa Valley, and was formerly the PlumpJack Group’s wine director between 2004 and 2009.